Not to be one-upped by Unreal, a CryEngine subscription will only set you back $10 a month. Earlier, Epic Games made a landmark decision in deciding to make its Unreal 4 engine available to anyone and everyone for the low subscription price of just $19 per month. Crytek, not one to be one-upped by Unreal, has returned fire, announcing that its own CryEngine will also be switching to a subscription model, albeit, for the even lower price of $10 a month. Best of all, for aspiring indie devs, there will be no additional royalties or licensing fees on top of the $10 monthly subscription. "As a first tier of its new program, Crytek has revealed that from May this year, indie developers will be able to use all of CryEngine's cutting-edge features for a monthly subscription fee of 9.90 USD/EUR per user - royalty free. Those features include the recently announced addition of CryEngine features such as Physically Based Shading, Geometry Cache and Image Based Lighting - an upgrade already shown in action by Crytek at this year's GDC conference in San Francisco." Carl Jones, Crytek's Director of Business Development, said: "When we announced the new CryEngine this was our first step towards creating an engine as a service. We are happy to announce now that the latest update of CryEngine will soon be available to all developers on a subscription basis. We are really excited to make CryEngine available to hundreds of thousands of developers working with Crytek to make awesome games." 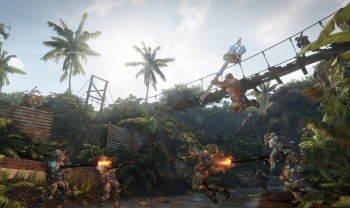 CryEngine is the technology that powers Crytek's own games, such as Crysis and Ryse: Son of Rome, as well as third-party titles such as State of Decay and MechWarrior Online. This is fantastic news for small developers, who now have an actual choice between the "big three" (Unreal, Unity, Crytek) when choosing which engine they want to use.